In a fairly rare occurrence, a mayor demanded the resignation of his police chief after the chief refused to appear by the mayor’s side and admit to mistakes he made handling a sexual harassment case. 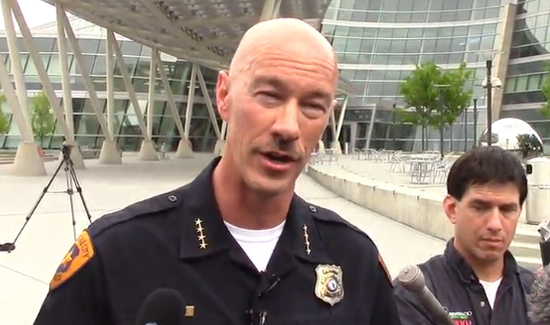 The blowup occurred in Salt Lake City, Utah, when Mayor Ralph Becker accused Salt Lake Police Chief Chris Burbank of mishandling sexual harassment complaints brought by three female officers. The Mayor was upset when Chief Burbank failed to demote the deputy chief who had been accused of harassment after an official request from the Mayor’s office. In a separate news conference Chief Burbank, a nine-year veteran, defended his actions in putting Rick Findlay on paid leave for several months until he retired with full benefits last June, instead of demoting him. Burbank said he could not agree to the mayor’s “ultimatum” of reading a prepared statement and apology. He said he was given only minutes to decide whether to read the statement in front of TV cameras and reporters, resign, or be fired. He said he considered the statement “wholly inappropriate” and announced he would resign. The sexual-harassment case in question involved complaints the former chief said he believes he handled appropriately and that discipline is a policy matter, not a political one. “I firmly believe that the police department and myself personally have handled sexual harassment with zero tolerance,” he said.